Special Pre- Order Price – Order Yours Today! The new sensation in the world of portable physiotherapy devices for Professional, Clinical and Home use utilizing Dynamic Electro Neuro Adaptive Stimulation. Today I would like to go over the menu buttons of the DENAS T 3 and explain how each button works. 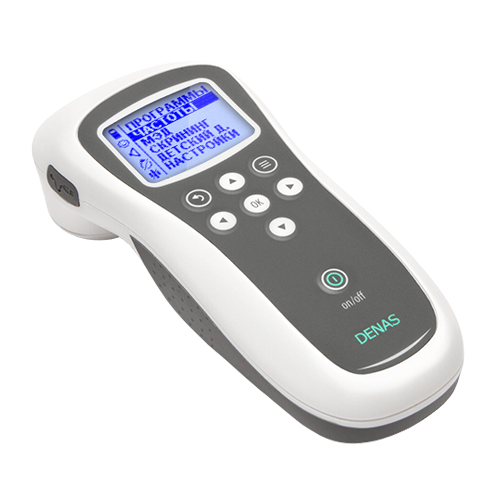 The DENAS T 3 is a simple but yet effective device without any special preset therapeutic health modes. 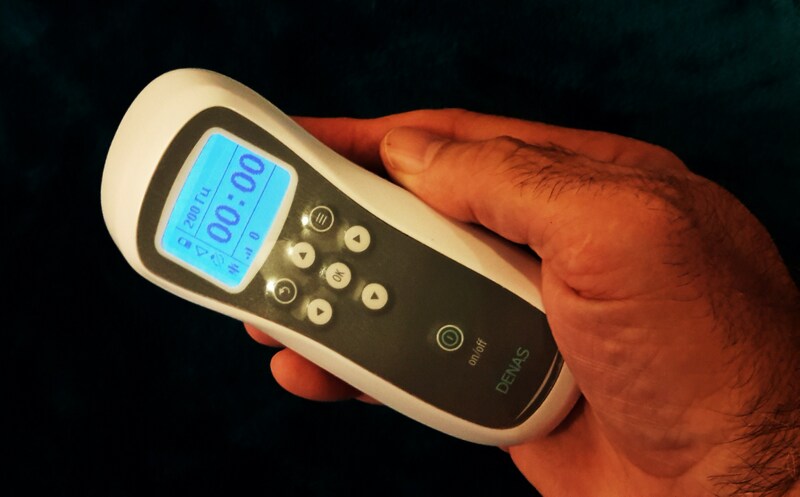 It includes the eight basic frequencies of Denas Therapy 10hz, 20hz, 60hz, 77hz, 140hz, 200hz, 77/10hz and 77am. These eight frequency modes are very effective for treatment of pain and general health issues. The DENAS T 3 does not include the ultra low frequency mode set of 1hz- 9.9hz that is available in the Diadens PCM3 and DENAS PCM4. These ultra low frequencies are very important for the precise treatment of specific health issues and diseases and are included in the more advanced Denas PCM3 and PCM4. The Denas T 3 device is not addictive: you can apply device over a long period of time without any loss of achieved results of therapy in case of pain relief, locomotive disorders, rehabilitation after trauma and surgery etc. The Denas therapy is Drug free and Non invasive, safe and effective. It can be combined with medical or pharmaceutical treatments or non medical therapy like massage, physiotherapy and other homeopathic treatments. 1) The body of the DENAS T 3 is ergonomically designed for comfort and ease of use and application. 2) On the side there is a grey cover that opens and allows the connection of many attachments for Denas Therapy. These accessories include the Massage Electrodes, Dens Applicators, Denas Reflexo, Acupuncture Point Probe, Electro Therapy Pads and Denas Glasses. 3) Menu Screen liquid crystal display with adjustable background. 4) Keyboard face of device body. 5) Button to increase the electrical intensity of therapy session. 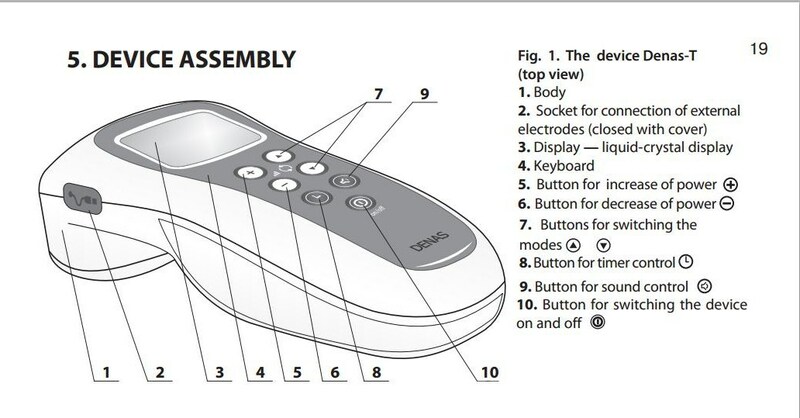 6) Button to decrease the electrical intensity of therapy session. 7) Arrow up and down buttons for scrolling through frequency modes for Denas Therapy and MED mode and Screening mode. While scrolling you will see the following frequencies 10hz, 20hz, 60hz, 77hz, 140hz, 200hz, 77/10hz and 77am. Also there will be two Russian words. MED is the Minimum Effective Dose mode and the longer word is the Screening mode. 8) Button control for timer. This button allows you to change the time of therapy session from 5 minutes to 30 minutes in five minute increments. 9) This button is for increasing, decreasing or muting the beeping sound of the device. Therapy 60, 77, 140 HZ – special program for therapy of pain, edema, inflammation, rehabilitation in case of spinal and joint diseases; Therapy 140 HZ- Applied in the same therapy as 200Hz- VERY INTENSE pain relief, plus in cases of acute inflammation, pain, acute illness, severe itching (insect bite, allergies), has pronounced decongestant effect, as well as relieving effect. Coach Jimmk K demonstrates the differences between the Diadens PCM3 and the Denas PCM4. Explaining the menu modes, frequencies and warranty offered by each model. Denas Pain Relief Store offers Lightning Fast Same Day Shipping to provide our USA customers delivery coast to coast in 2 days. We also deliver Worldwide by Express Air. 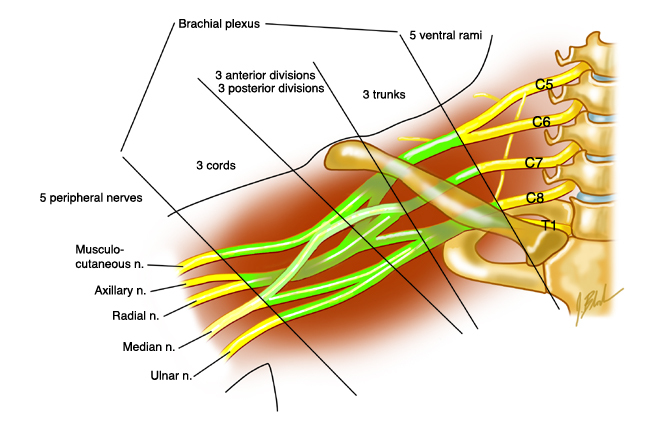 The brachial plexus is the network of nerves comprised of the C-5,6,7,8 and T-1. The nerve bundle comes off the side of the neck and travels down and under the collar bone. The brachial plexus sends signals from your spinal cord to your shoulder, arm and hand.Brachial plexus injuries occur when these nerves are stretched, pinched, or in the most severe cases, ripped apart or detached from the spinal cord. There are a variety of conditions that cause Brachial plexus injuries from sports impact traumas, inflammation, vehicle collisions, falling off a ladder or tree and landing on your shoulder. Most injuries are acute and will heal shortly with proper treatment and rest, but sometimes due to occupational task such as reaching up or lifting heavy items over your head tend to irritate and prolong healing and become chronic.